BACKFLOW & IRRIGATION CONTROLLER THEFT PREVENTION CAGES NOW AVAILABLE!! Our patented vacuum breaker & Irrigation controller theft prevention cage is made in Taylor Michigan, U.S.A.
We utilize patented theft prevention 3/4” x 2” Locking bolt to secure our unit to the structure, completely covering the backflow unit but still allowing access to master ball valves & inlets for service and or winterization of the unit. Our unit’s come completely assembled ready to install with (4) Hex pin anchors and bolts along with one unlocking bit. Our unit’s can be installed on almost any backflow unit from ¾” to 2 ½” and any Irrigation controller. Our unit comes primer powder coated hunter green , our unit can be installed in less than 10 minutes and provides a lifetime of protection against vandalism and theft. 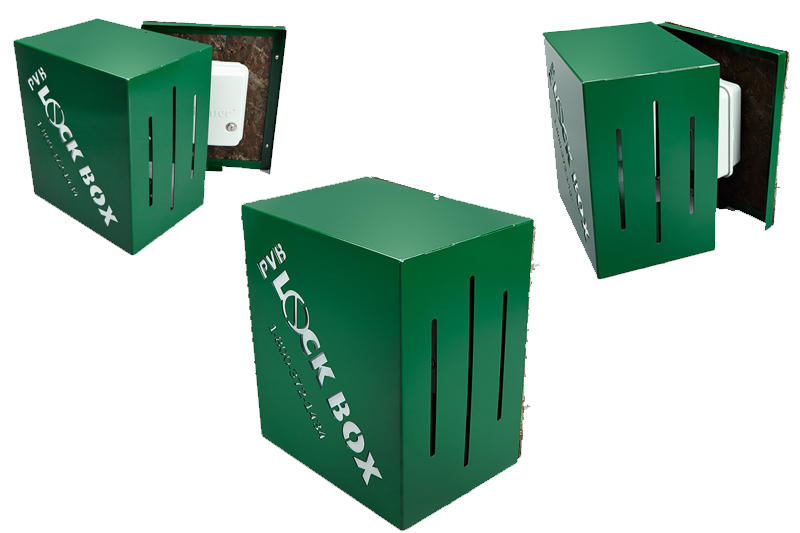 Buy PVB Lock Box Now! Now Available at John Deere Landscapes, Spartan Irrigation, Trost Irrigation, Grosse Ile Lawn Sprinklers & D&R Properties.